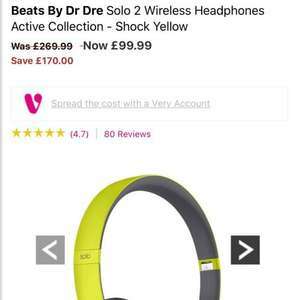 Beats Solo 2 Wireless in Shock Yellow are currently reduced on Very for £99.99. If you create a new account (just use a new email) and use code 6TFTK or KXVL6 if that doesn't work it will knock a further £20 off bringing the headphones to just £79.99. I believe you have to purchase using the buy now pay later option however I selected the option to pay over 6 months interest free. The £20 credit was paid immediately to my account and then I just paid the outstanding balance. Unfortunately there is a £3.99 delivery charge however £83.98 for a new pair of beats wireless is the cheapest I've seen. I'm sure the majority of post will be to **** off beats as a company however if these are the headphones you want and don't mind the colour, this is the cheapest I have seen. I used a different email and the above code worked for me. Will be shipping today. Worth a try. If all else fails have them delivered to to friend or relative however I already have an account at the same address and there were no issues. HiI used a different email and the above code worked for me. Will be … HiI used a different email and the above code worked for me. Will be shipping today. Worth a try. If all else fails have them delivered to to friend or relative however I already have an account at the same address and there were no issues. Ordered 1 last week when this was posted and it said 'order being processed'. Very eventually cancelled my order and left my available credit at 0 because someone noticed I had 2 Very accounts and your only allowed 1. I called the security department and explained it was an isme that became Very so it's really old. They said ok we will alow the 2 accounts. Whenever it says 'order being processed' they have to check the order etc... so it could be cancelled and you might get a phone call from them. Ordered 1 last week when this was posted and it said 'order being … Ordered 1 last week when this was posted and it said 'order being processed'. Very eventually cancelled my order and left my available credit at 0 because someone noticed I had 2 Very accounts and your only allowed 1. I called the security department and explained it was an isme that became Very so it's really old. They said ok we will alow the 2 accounts. Whenever it says 'order being processed' they have to check the order etc... so it could be cancelled and you might get a phone call from them. Hopefully won't have this problem but thanks for the heads up. How long do they normally take to dispatch an item? Can anyone comment on these if these are actually any good ? I note the solo 3 is out, but is this a good buy at £99 ? Hopefully won't have this problem but thanks for the heads up. How long … Hopefully won't have this problem but thanks for the heads up. How long do they normally take to dispatch an item? Can anyone comment on these if these are actually any good ? I note the … Can anyone comment on these if these are actually any good ? I note the solo 3 is out, but is this a good buy at £99 ? Mine are due for delivery today so will let you know if i get chance. The solo 2 are exactly the same as solo 3 apart from the 3's having a better battery life and connect to apple devices more seamlessly due to new chip inside the headphones. Solo 2 battery lasts 12 hours which is plenty and both the look and sound are identical. Mine have dispatched. Fingers crossed it all goes to plan. Cold. You are encouraging fraud and this will effect Very's profits. (_;) Ordered one pair under my name, one in my mum's, one in your mum's, one in my dads, one in my neighbours and one to the front desk at work. Was going to buy, add to account and changed my mind at last minute and closed down the browser after getting lots of messages from friends saying they are over priced and over hyped.